In the past, the only way to provide high-quality decorating of durable goods with a camouflage pattern was by an immersion process. Filcon offers a new technology for camouflage decorating. This new process involves high-quality printing of camouflage patterns to plastic films. The films are made of materials that are durable and provide protection from the sun's UV rays. The films are laminated to rigid plastic sheet to form a permanent bond. The plastic sheet is then thermoformed or die cut into your desired part. Film materials are compatible with plastics such as ABS, polyethylene, polystyrene and TPOs. These new products offer all of the high-quality camouflage decorating that immersions can, at a fraction of the cost. When reinforced with adhesive, our films allow camouflaging various materials. Filcon's films can also contain a magnetic backing for your special metal applications. 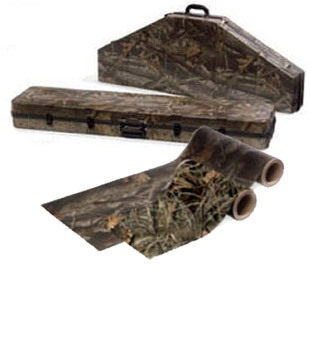 For assistance in your thermoforming requirements or more information on our camouflage products, please contact us.